The body’s immune cells fight invaders such as bacteria or viruses and thus protect against diseases. However, in rare cases, it is the immune cells themselves that harm the body, for example, if they divide in an uncontrolled manner and form tumors. This is exactly what happens in cutaneous T-cell lymphoma, a type of cancer of the lymph system, where immune cells known as T lymphocytes get out of control. Uncontrolled T cell growth can be caused by a defect in a signaling pathway known as NF-ᴋB pathway, which controls T cell activity and development. Inflammatory signals such as fragments of bacteria or viruses activate this pathway. A number of proteins within the cell transmit the signal received from outside into the nucleus, where eventually the activity of individual genes will be changed. As a result, T cells start proliferating and actively fighting the invaders. Once the danger is averted, several “off” switches will make the T cells revert to their resting state. If this mechanism fails, T cells may continue proliferating and lead to cancer. Only a few “off” switches are known to date. Markus Brechmann und Thomas Mock, the two first authors of the article, from the Immunogenetics Division at DKFZ, have now identified PP4R1 as a key “off” switch. If this subunit of an enzyme is missing in T cells, the NF-ᴋB pathway will remain permanently active, which leads to tumor formation. To find this key “off” switch, the investigators modified T cells to make them fluoresce for a short time when the NF-ᴋB pathway is switched on by external stimulation. They subsequently introduced various short RNA fragments into the cells, which bind specifically to a particular messenger RNA in the cell so that this messenger RNA is blocked. Each messenger RNA is an instruction for building a specific protein. If it is blocked, this protein will be missing. If the protein that is missing is an “off” switch, the T cells fluoresce permanently. Collaborating with Professor Michael Boutros, also from DKFZ, the researchers tested over 1,000 RNAs in a screening. “Those cells that were unable to produce the PP4R1 protein kept on fluorescing and failed to return to the resting state,” says last author Rüdiger Arnold. “This was a clue that the cells are unable to switch off the NF-ᴋB pathway in the absence of PP4R1.” PP4R1 is a subunit of an enzyme and the researchers were able to demonstrate that this protein plays a key role in switching off an activated NF-ᴋB pathway. Using patient samples obtained from clinical partners in Cologne and Mannheim, the investigators were able to confirm that a number of cutaneous T cell lymphomas can really be attributed to reduced PP4R1 production. The researchers found first evidence suggesting that PP4R1 is not only involved in the onset of T cell lymphoma but also in other types of cancer. They are now trying to find the reason why some cancer cells stop producing PP4R1 and are hoping to contribute to new treatment possibilities in the future. Brechmann M, Mock T, Nickles D, Kiessling M, Weit N, Breuer R, Müller W, Wabnitz G, Frey F, Nicolay JP, Booken N, Samstag Y, Klemke CD, Herling M, Boutros M, Krammer PH, Arnold R. A PP4 Holoenzyme Balances Physiological and Oncogenic Nuclear Factor-Kappa B Signaling in T Lymphocytes. Immunity. 2012 Oct 19;37(4):697-708. Tissue section of cutaneous T cell lymphoma. The nuclei are stained blue, PP4R1 brown. 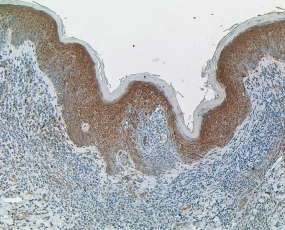 The subcutaneous T cells do not show any brown color and hence lack PP4R1.